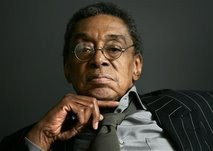 It was just the hippest trip in America, that's "trip" not "hit"
Don Cornelius, the former host of the television show "Soul Train," was arrested on suspicion of domestic violence. Police were called to his Hollywood Hills home late Friday after someone reported a domestic dispute. The 72-year-old producer was taken to jail, where he was booked for investigation of felony domestic violence, Park said. He was released on $50,000 bail and ordered to appear in court next month. Cornelius stepped down as "Soul Train" host in 1993.